About a week ago I wrote a blog post about how I was making the choice to finally but into Medium Format Digital, and that I was about 90% sure of the decision to go with the Fujifilm GFX-50S to make the jump. Well, I started writing that post long before I had any hands-on time with the GFX (even though it went up after I handled the camera), and after spending some time with it (you can read my first impressions here), I wasn't quite sold on it as I thought I would be. So I started looking at other options, including older, previous-generation SLR Medium Format cameras. Namely, The Hasselblad H4D and H5D series with 40 or 50 megapixel backs. The 60 megapixel model for the H4D has a full-sized Medium Format sensor, but is still quite a bit more expensive than the GFX. Price. Brand-spanking new, the GFX will cost me $6,500 for the body, and $1,500 for the GF 63mm f/2.8. That's $8,000 all-in, brand new. For a comparable system with the same sensor (CPO Hasselblad H5D-50c model, X1D, or Pentax 645Z), It would run anywhere from $9,000-15,000. That's a lot of money saved that can go toward another lens for the GFX (The 110 f/2 later this year looks like it'll be a hit), or the grip and angle adapter, both of which enhance the usability and versatility of the camera. 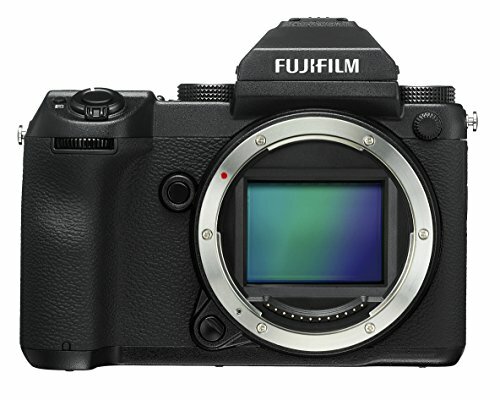 Fuji is using an "old" sensor, but I think that's helped them price the GFX aggressively, and the sensor has proven itself in multiple cameras by now, and is a good performer. Further, It should help the GFX supply since the sensor is already in production. In short, It should be fairly easy to acquire a GFX if one wanted one — there shouldn't be too much waiting (if any at all, this is a niche camera, after all) if you didn't pre-order it. Size & weight. The first thing I noticed when I picked up the GFX at a demo day, was just how light the body and lenses were. I picked them up expecting them to have the heft of at least high-quality DSLR glass, but they felt more along the lines of the Fuji XF f/2 lenses (23 f/2 and 35 f/2) — they felt incredibly light considering their size and the fact that it's medium format — everything should be bigger and heavier, but it's not. The size and weight of the GFX with a lens attached is about the same or less than a comparable "prosumer"-level DSLR like a 7D or 5D series camera with a nice lens attached. This means that it can easily be used as an "everything" camera, provided you are aware of, and can deal with the slower, more methodical shooting of Medium Format. It absolutely will not ever be a "snapshot" camera, because it simply isn't fast enough for fleeting moments. Wi-Fi — While it's a "consumer-level" feature, many companies are now starting to realize the benefits of Wi-Fi integration. I use wi-fi to transfer or remotely trigger my X-Pro 2 all the time, and, even though i begrudgingly paid $600 for the Canon WFT-E8a wireless dongle for my 1DX Mark II, I have since found it incredibly useful, and worth the price paid. The inclusion of Wi-Fi is also seen in the newest Hasselblad bodies, as they too are realizing the usefulness of such a feature. Other Medium Format offerings at this price point (Used Hasselblads, Pentax 645Z) do not have built-in WiFi support. USB 3.0 — At the sub-$10,000 price point, only the X1D and Pentax 645Z have USB 3.0 support. The older Hasselblads in this range are FireWire 800. I don't own a newer MacBook with ThunderBolt, nor have I added ThunderBolt ports to my desktop via an expansion card. since FireWire can't be adapted to USB, I would either need to get a FireWire card for my desktop (which isn't feasible for location shooting), or buy a new/used MacBook that supports ThunderBolt, so I can then adapt the FireWire to shoot tethered. USB 3.0 is much more commonplace, and it seems more reliable and stable than older FireWire connections. Big plus. 425 focus points. While its focus system is a slower contrast-detect (rather than the speedy phase-detect of most SLRs of today), the GFX has a whopping 425 focus points, compared to 9 on the X1D and ONE on Hasselblad SLRs. While the Hasselblads have True Focus, having 425 points covering a huge area of the sensor, eliminating the need to recompose at all. Different aspect ratios. The GFX has a whole slew of different aspect ratios available to shoot in: 4:3, 5:4, 7:6, 1:1, 3:2, 16:9, and ultra wide 65:24. It does this by pixel binning, so in any format other than the sensor's native 4:3, you'll get a smaller resolution file (5:4 being 48 megapixels, and going down from there all the way down to 25 megapixels at the 65:24 ultrawide aspect ratio). This feature is pretty cool if you don't often crop in post. 1/125th X-Sync. This was a deal breaker for me. The big draw of medium format systems for most commercial photography, is their use of leaf shutters to enable flash sync at any speed. Many of the older cameras can sync at 1/800th, 1/1000th, and 1/1600th, and the newer generation can sync up to 1/2000th. That kind of ambient-taming power is invaluable for location shooting where you can't easily control strong sunlight. However, this is easily remedied with ND filters and more powerful flash units. Thankfully, the lighting I own is up to the task. Throwing on a 3-stop ND would give the "equivalent" of a 1/1000th X-sync, provided that your lights are powerful enough. Note that this is a false equivalency, because you will still be limited to 1/125th, which simply may not be fast enough in very bright conditions outdoors with moving subjects like a dancer or maybe a dynamic fashion shot. There is some hope, though, with the addition of an H-mount adapter that will allow you to adapt Hasselblad HC lenses and make use of the leaf shutter in those lenses to enable sync up to 1/800th. The adapter runs a fairly hefty $659, and will add an additional cost to a GFX kit, plus the cost of the Hasselblad glass. Additionally, There are rumors of Profoto releasing an Air Remote TTL-F sometime this year (2017), which would make my B1's and B2's capable of HSS with the GFX, which could, at least in part, remedy the issue with the flash sync. I can only hope that Broncolor will release a Fuji-compatible RFS 2.2 so that I would also be able to use HS on my Move 1200L. Size & weight. You'll notice I mentioned this twice. It's a bit of a double-edged sword. For a Medium Format camera, one would expect it to be larger and heavier. For something at this price and given the traditional expectations of the format, having something so small and light feels a bit...weird. I also noted in my first impressions that the grip didn't seem to be deep enough to get a good purchase on the camera. This isn't an issue with the Fuji GF glass, because they are so light; however, with something longer or heavier (like the 120 f/4 macro, or maybe even an adapted Hasselblad lens), it feels imbalanced. And while the protrusion on the back of the camera helps your thumb get a better grip on the camera, the main grip on the right side leaves something to be desired for larger hands (or longer fingers). The imbalance issue can be remedied somewhat by adding the battery grip, albeit again adding additional cost to the setup. Focus speed/Viewfinder blackout. I had originally noted, in my time with a pre-production GFX, that the viewfinder blackout seemed exceptionally long. I hope that to not be the case in production models. I've read reports that there's a "high performance" mode on the GFX that may remedy this, so I'll wait to pass judgment on that front. Coupled with production firmware, and firmware updates, this could prove to be a non-issue. With regard to focus speed — it's Medium Format. That's the nature of it. Tethering & RAW conversion. At launch, Fuji will have its own "HS-V5" tethering software available, as it is unclear whether any other RAW converters will support it for tethering (I'm looking at you, Capture One) — C1 has made it a point to only support Phase One backs, and no one really knows if they have changed their tune with the release of the GFX. It's sure that Lightroom will eventually support tethered capture from the GFX, as it's distinctly outlined in the GFX brochure, but I have never been a fan of tethering to Lightroom. Let's hope Fuji's HS-V5 software is as stable and as full-featured as the competition. And yet... I'm still unsure. While I acknowledge that the list of "pros" outweigh the "cons" I have with the GFX, The flash sync is one that gets me the most. I use lighting on nearly all of my shoots, and being limited to 1/125th breaks my heart. One of the biggest draws for medium format, aside from "the look", the dynamic range, and wider range of tonality and gradation from a larger, 16-bit sensor — was leaf shutter lenses and having the ability to sync flash at any speed the camera could shoot at, giving way to more creative possibilities, along with making even smaller strobes essentially more "powerful" due to the ambient-cutting power of those lenses, or enabling faster recycle times by shooting at much lower power with more powerful lights. However, even with this in mind, I'm still torn in the direction I want to take with a leap into Medium Format. The camera would be used mostly in studio and occasionally on location, for commercial jobs where high-resolution files are wanted, or for some personal projects. That being said, considering how I shoot, flash sync is a very high priority for me. Guess I'll have to have some extended hands-on time with the GFX before I make my decision. What do you think? what are your reasons for considering medium format? Which way would you go in this situation, or have you already decided? Let us know! And as always, if you're thinking about buying some gear, use our Amazon links; it helps us create content that you like to read or helps you out, and it costs you nothing — win/win!